The festive season is rapidly approaching: time to start thinking about booking up a Christmas break, and here at Cool Places we've got an array of amazing options across the UK. The best bit? They're all offering special packages or winter discounts. Read on for our top picks, ranging from country pads and rural retreats to seaside hotels and city centre boltholes. Head to these luxury woodland cabins in Norfolk where all of the cabins are extremely comfortable, some even have hot tubs and wood-burners. There are plenty of on-site facilities and and range of woodland activities. Even better, save 20% when booking a winter getaway. Truro's best hotel – a grand old building with some very cool, contemporary rooms – is offering the ideal foodie break over Christmas, with top-notch tipples and award-winning hearty feasts served during a 5-night stay. The added bonus? Beautiful Cornwall is right on the doorstep. Journey to this glamorously old-fashioned spot in Cornwall boasting a spectacular seaside location and revel in a 2-night package that includes drinks, canapes, a stunning Christmas Eve Dinner and entertainment, plus a lavish Christmas lunch to remember. 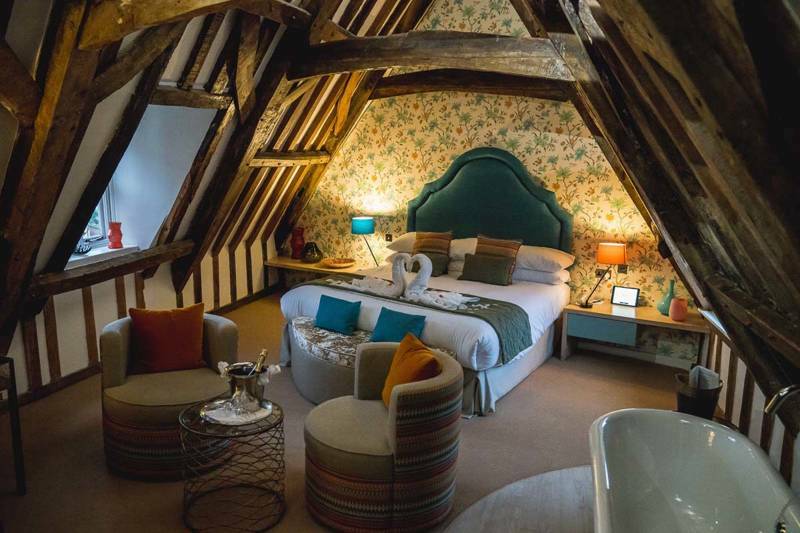 Book the Christmas package here and spend 3 or 4 nights in this delightful property situated in the historical centre of Norwich. The new owners have maintained its character and ancient layout while bringing its rooms right up-to-date. There's an excellent restaurant and cosy oak-panelled bar; it's one of the best-value places to stay in the city. Treat yourself to a luxury festive 3-night break and stay at this very comfortable family-friendly hotel with one of the best coastal views in the UK. Arrive to mulled wine and mince pies and enjoy the hotel in its seasonal glory. Get in there quick, the package is only available from Sunday 2nd - Wednesday 5th December. Beautifully furnished North Cornwall cottages of all sizes with tremendous facilities including a pool and sauna await in Padstow. It's a beautiful spot, comprising pasture, wetland areas and woodland that supports a diverse array of wildlife. Book now and receive festive savings. A place in which to immerse yourself in the beauty and history of Wales in the most elegant and contemporary of surroundings, head here for a relaxed and refreshing festive break. Their Christmas Celebration Escape will be filled with delicious drink, fabulous food and yuletide cheer. Head to the Herefordshire, Edinburgh or Bath outpost of this micro-chain and enjoy a range of offerings including value for money Dinner, Bed & Breakfast and B&B deals and treats of truffles and fizz. The only question is, which location? they're giving a 15% saving on 5 or 7 night stays over Christmas and the New Year. Escape to the peace and tranquility of a beautiful cottage before the big day with our friends in central Scotland. There's underfloor heating and a wood-burning stove amidst the wonderful scenery of Loch Lomond & Trossachs National Park. Right now, save 15% on the usual rates. Looking for somewhere the entire family can stay together in December? Hire a whole hostel, YHA have enough space for big groups. With spectacular properties across England and Wales there's something for all tastes. This cosy array of cottages has some fabulous offers over the festive period with savings of up to 20%. Wake on Christmas morning to the sound of the sea – how appealing does that sound? Stay in a real Welsh castle for Christmas and experience five-star luxury and panoramic views of Pembrokeshire. Be quick and book a magical break at fantastic rates. There are few places to stay in Britain as gobsmackingly awesome. Just because the winter is here doesn't mean you can't book a glamping getaway. Located in beautiful Orkney, stay in one of the inviting pods at super reasonable rates. Be sure to snuggle down and admire the wonderful bay views. A traditional flint cottage with a stylish interior, high-end finish and a garden complete with hot tub, it's one of a group of three self-catering properties in Norfolk. This luxe option has a whopping £500 saving for Christmas week (arriving Friday 21st December). Tempted? Part of the same group as The Brambles, this gorgeous let with three beautifully furnished bedrooms also has a £500 disount over Christmas. Settle in with a champagne welcome pack and hunker down for the week.